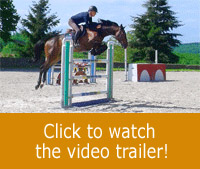 During this lesson, Michel teaches Marine and Day Dreamer on some flat work. The goal is to improve the connection between the horse and rider before the jumping session that will be following. In the first part of the lesson, Michel teaches Marine how to obtain an effective response to her leg actions. He reminds her of a few basics and in particular what would be the perfect rider’s position in order to be effective while favouring the horse understanding, the good flow of energy and the hind-legs activity. Marine’s position should also be suitable for her self-carriage as well as the one of her horse whether it’s on flat work or over fences. The driving force is sustained with the continuous connection with the horse’s mouth. During, the second part of the lesson, Michel explains to Marine how to strike a balance between the contact on the horse’s mouth and the movement of the horse’s neck while keeping a steady tension on the reins. The rider can, then, position her horse’s head at the level she wants, with the poll being the highest or in a full neck extension without disturbing her position or the movement forward. During the third part of the session, Marine has to combine her leg actions and the connection with her horse’s mouth during transitions and canter works. Michel shows Marine the attitude to adopt in priority to prevent the horse from being heavy on the reins, or from getting tense and pulling on the reins. At the end of the session, Day Dreamer and Marine are in a perfect connection. Day Dreamer is steady in his gaits and responsive to his rider’s aids, ready for a jumping session. .The influences take root in looseness. 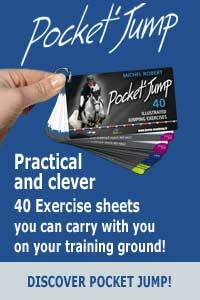 Pay attention to legs and knees that could pinch the horse’s sides..Use the mantra “Horse, get me there” to avoid preceding your horse during upward transitions or on the approach of fences.
. When the horse let go of the connection, it means that he doesn’t work with his back anymore. The rider’s arms have to be flexible to maintain a steady connection with the horse’s mouth.
. Don’t freeze in one position, but let your arms move freely to maintain a steady connection with the horse’s mouth.
. Accept mistakes and don’t look for perfection the first time.
. Assess at all-time your mental and body attitude.